JUNEAU, Alaska -- A fishing boat captain jumped into cold, choppy waters to save two of his crew members after their vessel capsized off the Alaska coast. 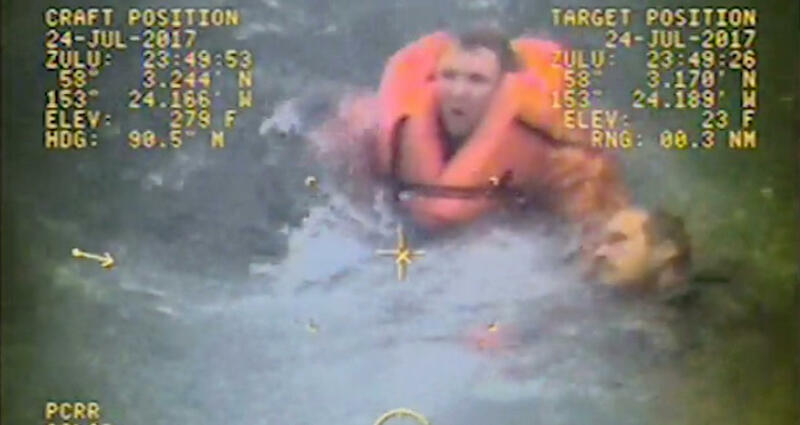 Coast Guard video of one of the rescues shows the captain in an orange life vest swimming to a man struggling to stay afloat and pulling him to an awaiting boat. The agency said the captain of the Grayling leapt into 47-degree water during Monday's ordeal near Raspberry Island, which is about 30 miles west of the Coast Guard station at Kodiak and about 255 miles southwest of Anchorage. A Coast Guard aircrew diverted from a training flight and saw the rescue. Seeing the man jump into the water without hesitation was incredible, said Lt. Kevin Riley, a pilot. "It is a testament to how tough those fishermen are and how far they will go to help their fellow Alaskans," Riley said in a news release. Coast Guard Petty Officer Bill Colclough said Tuesday that the captain administered CPR to one of the crew members, who was evacuated for medical treatment. The man survived, he said. A fourth crew member was rescued by another boat. The capsized boat had a skiff, which is used as part of fishing operations. Colclough said the other man rescued by the captain was able to get aboard the skiff and assist the captain. The cause of the capsizing was not immediately known. There were 17 mph winds and 5-foot seas at the time. Names of the crew members were not released.